Today would have been Sweet Praline's 17th Gotcha Day. She's always going to be in my heart but the ache is a little less each day because of the love of Truffle and Brulee. I know Praline is watching over all of us from the Bridge and she's whispering advice and mischief into Truffle and Brulee's ears. Happy Gotcha Day at the Bridge my sweet girl. 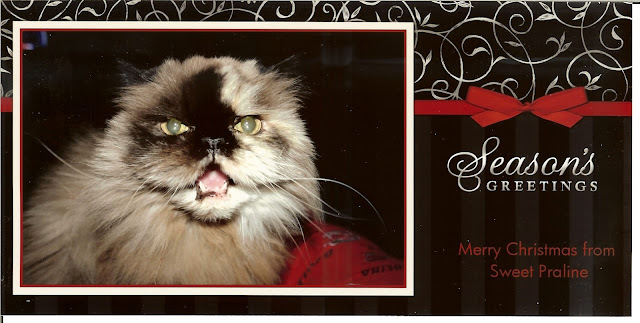 I thought I'd share the first Christmas card Sweet Praline sent out when she started blogging in 2008 for today's Gotcha Day. I always thought this picture showed her "diva" personality.